Dorothy Mae Taylor was the first Black woman elected to Louisiana State Legislature in 1971, with Oretha Castle Haley managing her campaign. Taylor served as an advocate for children, mothers, and the incarcerated, and was the builder of a network of ambitious Black political aides who would later go into public service themselves. After leaving the legislature, Taylor served as president of Total Community Action, Inc’s Central City Neighborhood Health Clinic, before becoming the first Black woman elected to New Orleans City Council in 1986. Taylor became council president in 1987 and opposed many policies of conservative mayor Sidney Barthelemy. 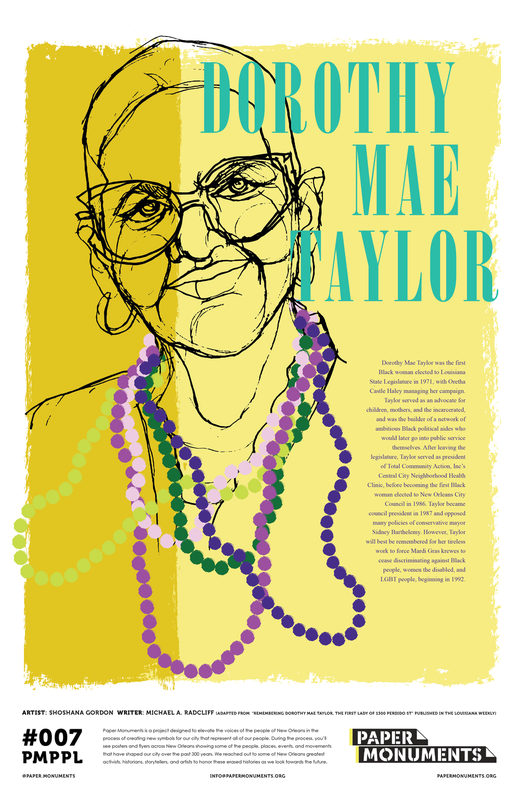 However, Taylor will best be remembered for her tireless work to force Mardi Gras krewes to cease discriminating against Black people, women, the disabled, and LGBT people, beginning in 1992.